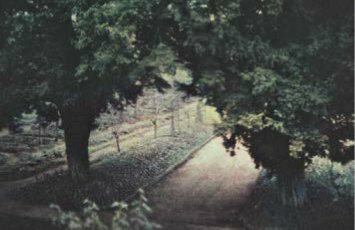 The exhibit presents 60 pictures taken in Giverny by French photographer Bernard Plossu. He came twice to Monet's house and gardens, first in Winter 2010 and again in Spring 2011, and worked at different times of day. The colour photographs have a very special atmosphere thanks to Plossu's use of the Fresson technique. The black and white pictures were printed by Guillaume Geneste.